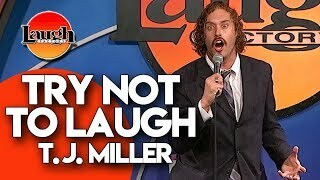 T.J. MILLER is one of the most sought after comedians in the world, certainly the northern part of the western hemisphere. He has been diligently working to make people laugh for over fifteen years, and is driven by the altruistic mission statement that life is fundamentally tragic and the best thing he can do is provide an ephemeral escapism from that tragedy which permeates everyday life by doing comedy. He has been performing his absurdist observational standup act worldwide for over 15 years, and has never gone to the bathroom in his pantaloons on stage. His hour-long comedy specials T.J. MILLER: NO REAL REASON (Comedy Central) and T.J. MILLER: METICULOUSLY RIDICULOUS (HBO) are available to stream now wherever streaming content is streamed. For no reason he produced two music albums, THE EXTENDED PLAY E.P., a hip-hop/pop/folk music E.P. with 41 tracks, and the ILLEGAL ART REMIXTAPE- available now on iTunes and wherever fake music is sold. Miller’s voice stars as Gene in the EMOJI MOVIE and Fred in Disney’s Academy Award-winning animated feature, BIG HERO 6. Miller also talks like an old drag queen after a hard night of chain smoking, and thus has voiced many characters including the character Tuffnut in the Oscar-nominated animated films HOW TO TRAIN YOUR DRAGON and HOW TO TRAIN YOUR DRAGON 2. He played Auggie in the first Rrated stop motion animated film HELL AND BACK with Nick Swardson and Prancer in ICE AGE: A MAMMOTH CHRISTMAS. In television, he voices Robbie from GRAVITY FALLS, Tuffnut in How To Train Your Dragon’s DRAGONS: RIDERS OF BERK, Brad in HIGH SCHOOL USA!, Randy in F IS FOR FAMILY and a volcano in FAMILY GUY. Don’t forget about GORBURGER, a show so strange you’ll just have to google it to understand. You may recognize his non-animated face and body from his roles in FOX’s big screen comic book adaptation of DEADPOOL, the highest grossing R-rated film of all time, 2014’s surprise indie hit TRANSFORMERS 4, Pete Holmes’ HBO comedy series CRASHING, Mike Judge’s HBO comedy series SILICON VALLEY, for which he received the Critics’ Choice Award for Best Supporting Actor in a Television Comedy, or even THE GOODWIN GAMES which was canceled after 7 episodes (he was also on CARPOOLERS with Jerry O’Connel and that lasted 13 episodes). When CHELSEA LATELY was a show, t.j. was on that show quite a bit. A ‘regular’ some might call him. Miller has been in over 25 major studio films- more than Fabio (and he was in Sharknado 5: Global Swarming) including CLOVERFIELD, SHE'S OUT OF MY LEAGUE, SEEKING A FRIEND FOR THE END OF THE WORLD, ROCK OF AGES, OUR IDIOT BROTHER, YOGI BEAR 3D (Ranger Jones, his greatest role to date), UNSTOPPABLE, GET HIM TO THE GREEK, SEARCH PARTY, THE GOODS: LIVE HARD, SELL HARD, and finally his good friend Jay Baruchel’s GOON: LAST OF THE ENFORCERS. Most recently, T.J. can be seen in OFFICE CHRISTMAS PARTY, opposite Jason Bateman and Jennifer Aniston, READY PLAYER ONE directed by Steven Spielberg, & DEADPOOL 2. He resides in New York City, NY, where he struggles to find meaning in an uncertain world. He is first and foremost, and always will be, a comedian. His Standup is “Smooth Like Fire, Hip Like Lincoln.” Next year T.J. can be seen in the upcoming film UNDERWATER opposite Kristin Stewart, a Twentieth Century Fox disaster thriller that is the perfect full circle return to his roots in Cloverfield. He will work until his death to make you happy. He loves you. Come and enjoy him perform.